Treat them with humanity, and let them have no reason to complain of our copying the brutal example of the British Army in their treatment of our unfortunate brethren who have fallen into their hands. 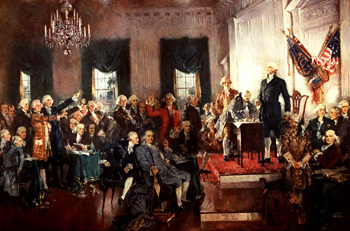 The Patriot cause and the Continental Army received incalculable wartime aid from a commune of pacifist Rosicrucian scholars, the German Pietists of the Ephrata Cloister, beginning with the publication of the Declaration of Independence and lasting through the aftermath of the battles at Brandywine, Paoli, and Germantown. The men of Ephrata’s Brotherhood of Zion and the women of the Roses of Sharon furthered the Revolutionary efforts in various meaningful ways. Footnotes Since the Wilderness will look at several, but begin with an encounter between George Washington and Prior Jaebez, the Reverend Peter Miller. Although a minor character in the Commander’s career, Peter Miller had- just perhaps- a profound impact on Washington. A relatively arcane event may help explain one or more pardons Washington granted during the Revolution and, perhaps, his Presidency. Washington, by 1775, had documented his predisposition to treat enemies per the parameters of the humanitarian ideals evolving in the minds of the leaders of the young nation. That doesn’t mean that, a few years of disillusions, frustration, bloodshed and scattered betrayals down the road, the man didn’t require a little reminder of his own principles. Peter Miller taught George Washington a lesson in forgiveness and charity when Miller petitioned the Commander in Chief to pardon the Cocalico tavern owner and convicted traitor, Michael Widman. Widman had been a vocal Patriot. After the colonies declared independence, Pennsylvania’s Lancaster County had formed a Committee of Safety, and Michael Widman spearheaded that Committee from inception. 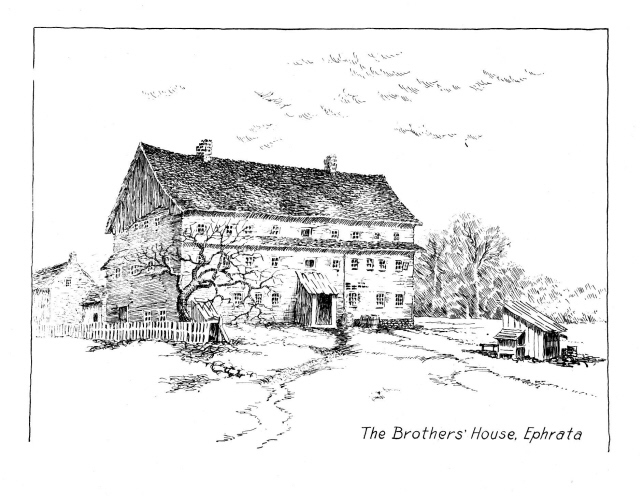 Following the nearby Battle of Brandywine and the British occupation of Philadelphia, General Howe dispatched two men, traveling in cognito, to gather intelligence near the Ephrata Cloister because, by that time, the cloister had become the principal hospital for Continental soldiers wounded near Brandywine. The men stopped for supper and lodging at Michael Widman’s tavern, a short ride from Ephrata. Widman spoke of General Howe in an uncomplimentary manner. His guests were murderously perturbed. Enemy pistol to his chest, Widman managed to break through the window to his rear, and escape into the black night. Fearing that his life depended upon finding refuge from his pursuers, he hid in the attic of the brother’s house at Ephrata. All Germantown knew that Widman, a prominent, combative member of the Reformed church, had serious issues with the heretics at Ephrata. The cloister was the last place the townspeople would expect to find Michael Widman. Zion for three days. Hungry, sleepless, at wit’s end, he grew convinced he would be executed if discovered by the British. He resolved to leave Ephrata and head for Philadelphia, request an audience with General Howe, apologize for his loose tongue and beg for clemency. Widman stopped home to tell his wife of his plight. When he reached Philadelphia, Widman saw Howe. Widman offered General Howe the locations of the Rebel munitions stores. Widman couldn’t even claim the honors due a rat. Meanwhile, his wife had told the authorities of his plan to betray the Continental Army. As soon as he emerged from behind British lines, militia seized and hauled him to the Block House in West Chester. At court-martial, he was convicted for treason. Peter Miller was the only person who spoke on Widman’s behalf, not at his trial but, after walking overnight from Ephrata to Valley Forge—quite a hike- he spoke directly to George Washington. Washington received Miller with respect and grace. They knew one another. Washington was fully cognizant and heartily appreciative of the service that Ephrata, and Peter Miller, provided the Patriot cause. Miller interceded between the Commander and his prisoner not, as Washington first assumed, because Widman and Miller were friends. To the contrary: Widman was Miller’s admitted “worst enemy,” and had treated the gentle, if intellectually aggressive mystic quite roughly over the years, as they frequently crossed one another’s path. Years before, Peter Miller had been the minister at the German Reformed church at Goshenhoppen, in Germantown. Under the influence of Conrad Beisell and the Dunkers, Rosicrucians, Pietists and Seventh Day Adventists at Ephrata, Miller rejected the more conventional principles of the Reformed Church. Michael Widman became the new minister. He took Miller’s defection personally. Widman spat in Miller’s face whenever they met, tripped him on the local footpaths, and at least once punched the saintly Peter Miller, who was wont to thank Widman for any abuse. 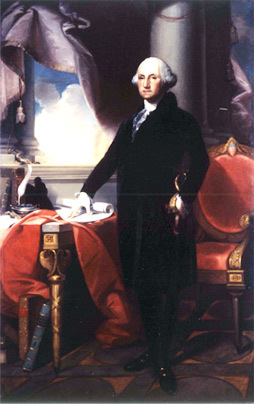 Washington, like numerous other leaders and scholars in the colonies, revered Peter Miller. Moved by the teacher’s argument, that Jesus had done as much for him, Washington granted Widman pardon and, with tears in his eyes, in front of his men, the Commander thanked Peter Miller for the lesson in charity. So did Widman. He and Miller walked home together. Here embellished, there diluted, the story has been distorted so many times over the years it feels a little like the cherry tree fable, but has more factual basis. Colonial records do not indicate that Widman was hanged; they do, however, show that he was punished. His property was seized and sold. Michael Diffenderfer bought four tracts of Widman’s land during March 1780. Peter Miller taught George Washington a lesson in forgiveness, charity, and non-attachment to the desire to punish and avenge, even during wartime. Ephratan scholars preserved the story for a reason or, maybe more accurately, two reasons. One was to illustrate the extent to which Peter Miller would sacrifice personal safety and welfare to perform an unselfish act of human kindness towards even his most bitter enemy. The second reason was to memorialize the kind of contribution that the men and women drawn to Ephrata could make to a Revolutionary cause that required bloodshed to complete. Above all a teacher, Peter Miller left home that night to forgive his enemies in a Christ-like manner; he also left home to teach another extraordinary man, one perhaps ‘chosen’ in a secular sense, the wisdom to do the same. Miller went out to sear a message into the spirit of George Washington and, by extension, into the Patriot cause and everything into which America had the power to evolve. Bettys promised to reform. He didn’t, and was eventually executed, but that’s not relevant. At the moment when Washington pardoned Bettys, he pardoned a man who, multiple times, had proven flagrantly unregenerate, notoriously disloyal to the Patriot cause, embarrassing to the Ball family, and who was making a living robbing, raiding, and killing colonists. Betty’s was clearly an enemy of the state, but was pardoned. Perhaps Washington had the example set by saintly, humble Peter Miller in mind.